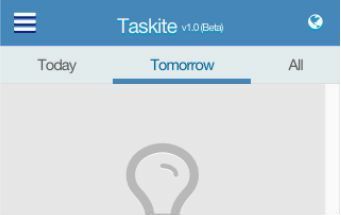 Taskite is task management application which helps you organize tasks and save them for future purposes. - Adding / Editing / Deleting Tasks. - Scheduling a reminder on web and mobile about your task. - Adding a picture or video to your task. - Getting directions and map view for your tasks. - Adding Company, Projects and people to your related tasks. Application is available on Android – iPhone & as a chrome extension. Taskite is task management application which helps you organize tasks and save them for future purposes. Features Include : - Adding / Editing / Deleting Tasks. - Scheduling a reminder on web and mobile about your task. - Adding a picture or video to your task. - Getting directions and map view for your tasks. - Adding Company, Projects and people to your related tasks. Application is available on Android - iPhone & as a chrome extension.